I think anyone in our class would have predicted her line at the end about oceanariums educating the public about orcas. What else can they say? I just think it's important to mention that no one loves these whales more than their trainers. I don't think you get into that line of work think you're exploiting them. I 100% agree with you, but it is an interesting dynamic. Heartbreaking story. It was predictable for us, but it was smart of them to give her the proper points to address during media training. 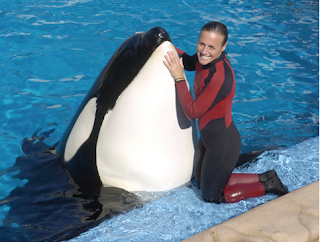 With all the focus on the evils of captivity, the educational value and the trainer-whale bond needs to be advocated. Regardless of the communications strategy, nothing can replace the loss and given that it is his third violent episode, I think Tilikum should be released.